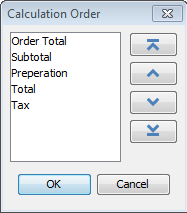 Q: I need to know how to set the field calculation order so the form works correctly. Is it possible in PDF Studio? 1. In PDF Studio, go to the “Forms” tab. 3. Select the field that you need to move by selecting the buttons on the right. 4. Click OK and start testing your calculations again.